As I’ve said elsewhere on this blog, I rarely read modern publications. I’m an old fashioned sort so, by modern, I really mean anything more recent than 1980-ish. I’m not sure why this is, perhaps it’s because I already have a large collection of old books, perhaps it’s because I always buy my books cheaply from charity shops and car boot sales, perhaps it’s because I rarely socialise and never discuss the bewildering array of new stuff being constantly written. So, I’ve dipped a tentative toe into the 21st century and I’m slowly turning over stones to see what horrors lay beneath. In a good way, you understand. 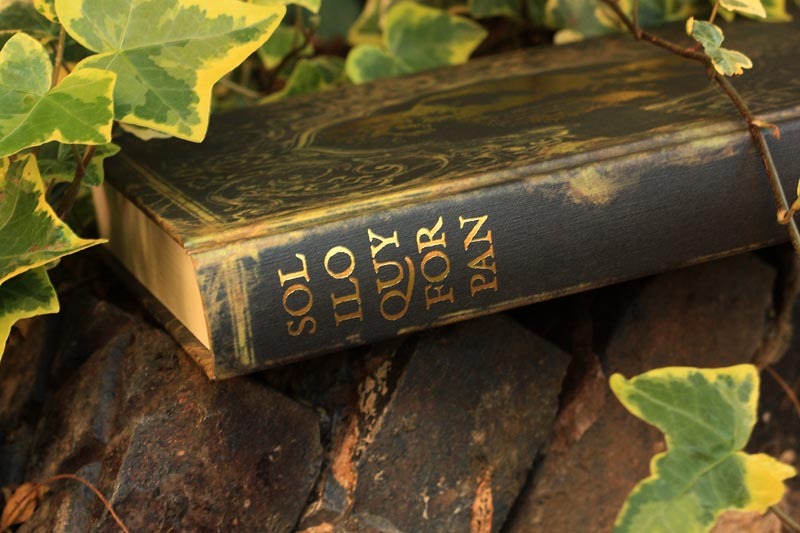 The book I was particularly interested in from Egaeus was their beautifully titled Soliloquy for Pan but, being late to the party as usual, their limited edition run sold out within two weeks. However, luckily for me (and countless others, I imagine) they released a second limited edition run of 200 copies a few days ago. I pre-ordered mine as soon as I heard and today a parcel was delivered! First off, just look at that cover. Beautiful, isn’t it? 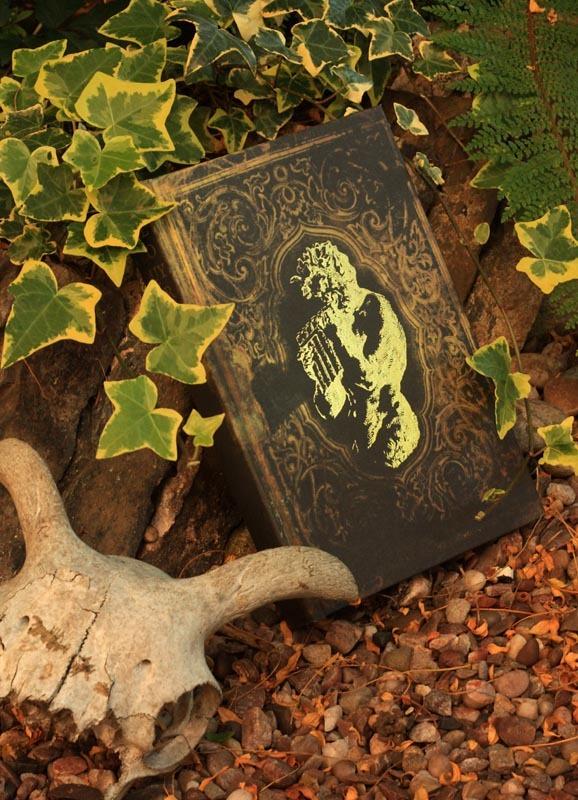 It’s made to resemble an aged and worn cloth bound edition from the late 19th / early 20th century. 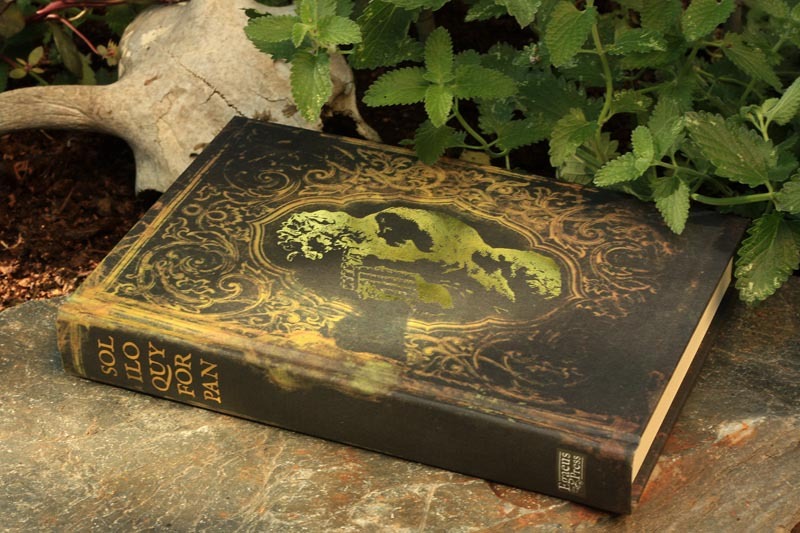 The foliate arabesque cartouche surrounding the gold-foiled Pan on the front cover and the gold-foiled Trajanesque typeface on the spine is reminiscent of the Arts & Crafts movement; which is, of course, the perfect choice for the theme of the collection as there was a massive resurgence of interest in Pan at that time. (I thought this book deserved a better treatment than my standard cover scan so all photographs are courtesy of Samantha Webster (she thought Pan deserved a setting of death and fecundity)). But then what happens when we open the book, surely the inside is going to be a bit of a let-down after the splendour of the cover? No, of course it isn’t. 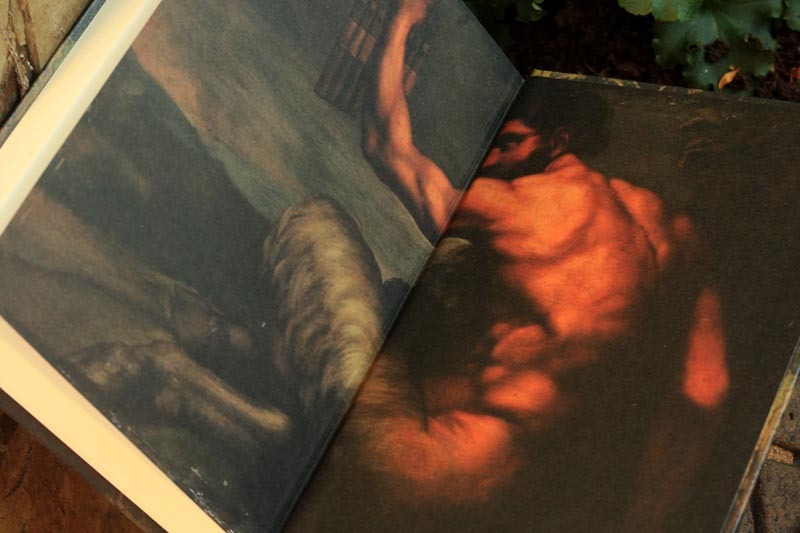 The endpapers, back and front, give us a 17th Century Italian portrait of the god himself. 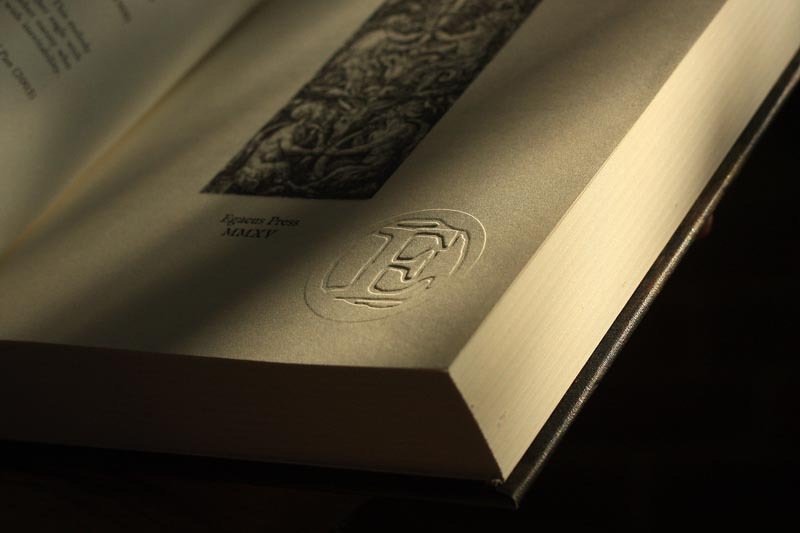 Even the title page is a treat, complete with blind embossed logo of the press. Isn’t that a lovely touch? The book as a whole has a pleasing heft to it, it sits nicely in the hand and the off-white paper stock is easy on the eye. Flicking through the pages I see the text is interspersed with illustrations and decorative flourishes. It’s easy to tell that a lot of attention to detail has been put into this publication, even the endbands are in a colour suited to the God of Nature, leaf-green! Glancing down the contents page I’m delighted to see a handful of classic authors I’m very familiar with, a few contemporary authors whose work I’ve become slightly acquainted with over the course of this year and a few more authors who, although I’m sure are quite well known to most, I’m yet to discover. I always keep a pile of books on a particular table in my house, these are books which I am currently reading or which I intend to read soon. Usually, a new acquisition goes to the bottom of the pile and gradually works its way to the top. I’m breaking that rule for Soliloquy for Pan, this one’s going straight to the top. Great article Mr Nash, I also share your feelings about the written word in exactly the manner you describe. I’m overjoyed to hear this tome is being reprinted as I missed out on the first run too and have only managed to find a single copy for sale since – the buyer wanted £200! I hope you enjoy reading the book as much as you obviously have done handling it, I shall be ordering my copy forthwith. Thanks for the blog link too, very much appreciated. All the best my friend. A double thankyou to you. One for your kind comment and one for introducing me to Egaeus. The last I heard they had already sold 3/4 of their 200 print run, so if you did want to grab a copy then best to do it soon. They’re selling like hot cakes. Pan-cakes, even!! All the best to you, Mr Scriber.